We may live in an information society where news from around the world reaches us as it happens, but that doesn’t mean that everything gets to us quickly. Take for example when Metzeler introduced the 270 – in reality a 280 – rear tire. They told us about it, but have one to Eurocomponents’ R&D shop, House of Thunder, in Germany. 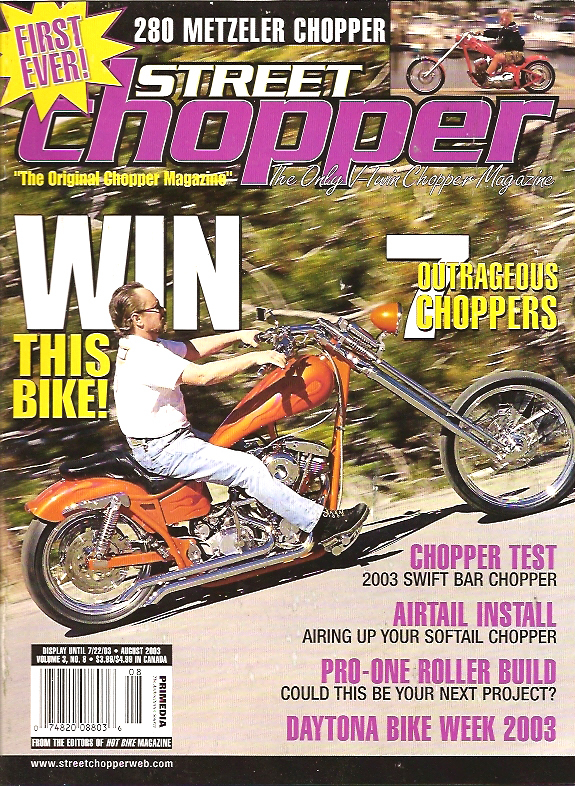 A scant 12 weeks later, including shipping it to the US, the very first 280 chopper was born. The House of Thunder crew took a look at their existing stock of Eurocomponents single-downtube frames and decided that they had one that could be made to work. The chassis started with 4 inches of upward stretch with 2 more in the backbone, converging at a 38-degree neck. Next, they took the Eurocomponents swingarm and quickly cut, widened, and turned it into the prototype for all the future 280 bikes. While working in the rear, they slid in a pair of Progressive Suspension shocks and an 18×10.5-inch Eurocomponents wheel wrapped in the 280. 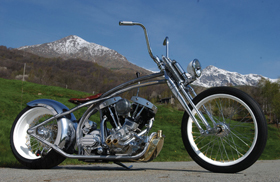 To round out the frame package, they installed a set of Deuce lower legs equipped with 10-inch-over tubes, a 5-dgree raked House of Thunder tree, and a Eurocomponents 21-inch wheel and Metzeler tire, of course. 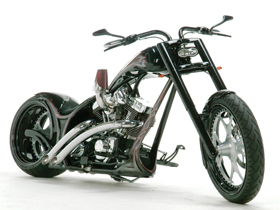 Power is provided by a Twin Cam motor – Eurocomponents offers the frame for Evos as well – but it is not stock by any means. When your shop is called House of Thunder, you need the power to back up the name, so it started with an unassembled TC-88 motor. First, a very-clean styling procedure took place. The cylinders had a few fins shaved off, and surfaces were powdercoated and then finished off with show-quality polish. Now onto the good stuff. The heads were ported, the cylinders bored, and a set of its own grind cams were installed. 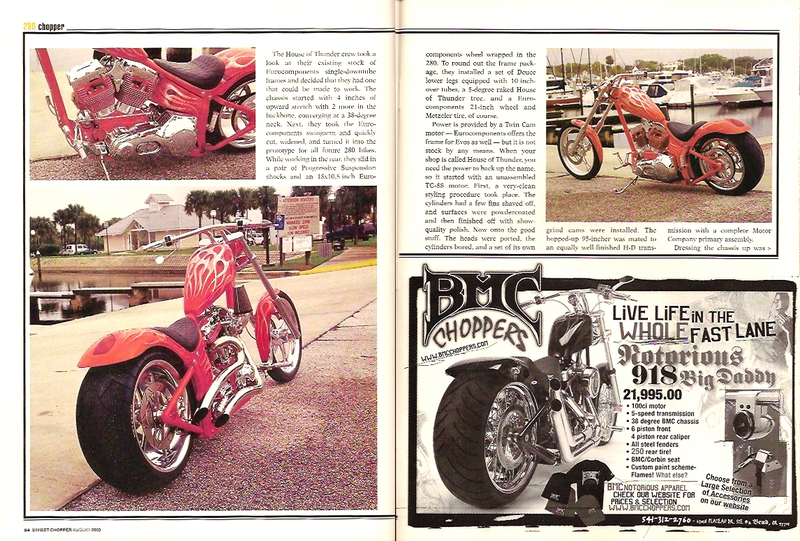 The hopped-up 95-incher was mated to an equally well-finished H-D transmission with a complete Motor Company primary assembly. Dressing the chassis up was an in-house affair. 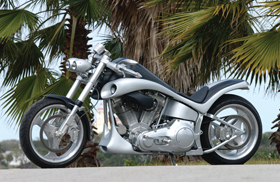 A sleek front fender was crafted, using the clean lines that Deuce mounts offer and ending in a sharp point. The gas tank has some XL-styling yet retains a boxy look to add some extra dimension to the bike – along with a pop-up Eurocomponents gas cap for additional smoothness. Out back, a strutless rear fender with built-in taillight was mounted just above the Eurocomponents oil tank. At that point, the House of Thunder guys molded everything until they felt it couldn’t be smoother and handed the metal off to Zappeck for the base-orange paint. A guy by the name of Danny stepped into the booth next and applied the flames and hidden skull graphics, then the clear went on to finish the job. Getting the bike ready to ship over to Eurocomponents in Daytona Beach was simple. It installed in-house-built bars, H-D hand controls, House of Thunder footcontrols, headlamp and taillight, and Eurocomponents signal grips and seat. 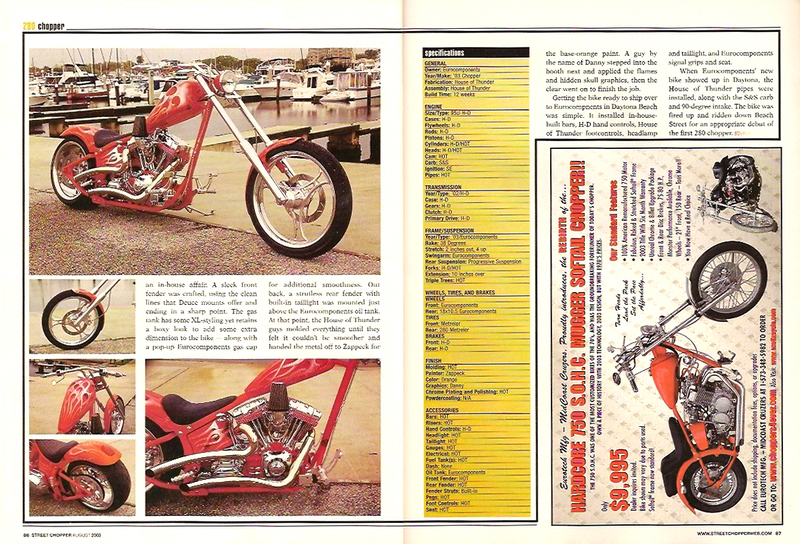 When Eurocomponents’ new bike showed up in Daytona, the House of Thunder pipes were installed, along with the S&S carb and 90-degree intake. 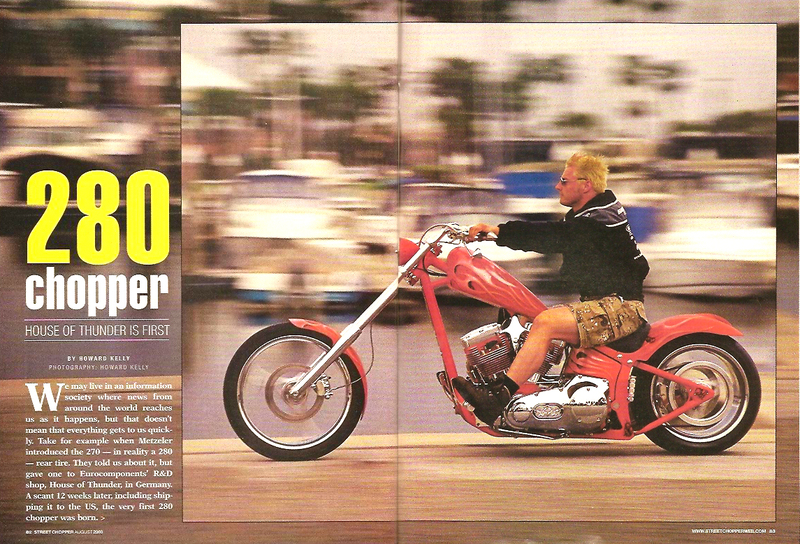 The bike was fired up and ridden down Beach Street for an appropriate debut of the first 280 chopper.